BC Oil Miracle holistic care ranges combine problem-solving solutions with an indulgent salon experience for all hair types in need of shine. Well-chosen oils offer smoothness and indulgence for hair and scalp. Discover the new BC Oil Miracle for fine hair with Marula Oil that moisturises and protects, without overburdening or the BC Oil Miracle thick hair range with Argan Oil for opulent shine and smoothness, or explore the BC Oil Miracle Rose Oil range to truly pamper your hair and scalp, and the BC Oil Miracle Barbary Fig Oil range for deep hair replenishment. BC Oil Miracle Gold Shimmer Conditioner Benefit: BC Oil Miracle Gold Shimmer..
BC Oil Miracle Gold Shimmer Treatment Benefit: BC Oil Miracle Gold Shimmer T.. Benefit: BC OIL MIRACLE Oil Mist for thick hair nourishes the hair, smoothens weightlessly, d..
BC Oil Miracle Divine Polish 100mL Benefit: BC Oil Miracle Divine Polish gloss eve..
BC Light Oil Miracle Shampoo for Fine Hair Benefit: BC Oil Miracle Light Oil.. 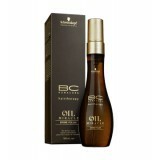 Benefit: BC Oil Miracle Oil Mist for fine hair nourishes the hair, smoothens weightlessly, detang..